In 2017 when the Lake District was awarded World Heritage Site status, Lake District National Park Chief Executive Richard Leafe said, “The Lake District is an evolving landscape that has changed over time and will continue to do so.” (1) In the Fell Pony world we know of this evolution because of its impact on our ponies. For more of the human history of the Lake District than not, the local native ponies provided the ‘horsepower’ for the region’s economy. Uses ranged from plowing and pulling sledges to shepherding and hunting wolves. When used for pack work, their loads of local goods included fleece, fish, metal ore, and more. (2) It is unlikely that any facet of the Lake District’s economy or history were untouched by the Fell Pony and its ancestors. Of course, like most working equine breeds, the Fell Pony’s work changed with the advent of the internal combustion engine (as well as the construction of railroads, roads, and canals). Since then, the Fell Pony has more often been put to use in recreational riding and driving. Stables for pleasure riding in the Lake District have existed at various places through the decades, and occasionally more adventurous outings have been possible when small enterprises have offered Fell Ponies re-enacting their historic role as pack ponies on Lakeland trails. The author and two Fell Ponies at Maiden Castle on Burnmoor in the Lake District in 2015. I learned of the evolving landscape of the Lake District when I had the great good fortune to walk over Burnmoor in the Lake District. One of the first milestones of the trip was Maiden Castle above Wasdale Head. The presence of Maiden Castle in what today is an uninhabited landscape seems odd. One theory says it was a residence during the Bronze Age. Its location up on the fell where not a soul lives today was due to the fact that living down in the wooded valleys was dangerous for humans because of large predators including wolves. It was safer to live up on the relatively barren landscape where predators and other dangers could be more easily seen at a distance. Today of course the uplands are considered uninhabitable by humans because of that barrenness and remoteness, and instead the valleys are preferred since the woods have been cleared, and the landscape has been domesticated for life. I did that walk over Burnmoor with two Fell Ponies, so I got to experience the evolution of both the Lake District and the Fell Pony first hand. The route was once a corpse road over which pack ponies carried bodies for burial in Eskdale because there wasn’t a proper burial place in Wasdale. When I first had the idea to traverse an historic pack horse route in the Lake District with Fell Ponies, I had no idea how hard it would be to find a route open to equines in modern times. I’m thankful that the Lake District landscape will continue to evolve so that perhaps more historic packhorse routes will again be available as bridleways in the future. The Fell Pony is already playing a role in improving landscape biodiversity as a conservation grazer. (4) And the Fell Pony clearly is part of the Lake District’s cultural heritage through its many roles as horsepower and recreation in the region. While the Fell Pony community may not have been involved in the creation of the management plan, it seems likely that the plan, too, can evolve so that together we can ensure that the Fell Pony’s part in the Lake District’s story is not forgotten. 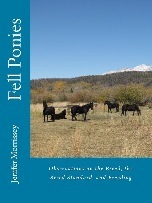 “Early History,” on “About Fell Ponies” page at www.fellponysociety.org.uk as accessed 20 November 2018. See, for instance, Morrissey, Jenifer, “Fells on the fells and Wild Horses on the Range,” Fell Pony News from Willowtrail Farm, April, 2015. The author’s exploration of matters relating to the Fell Pony can be found in her book Fell Ponies: Observations on the Breed, the Breed Standard, and Breeding, available internationally by clicking here or on the book cover. The Lake District National Park was awarded World Heritage Site status in July 2017. Many comments in the Fell Pony community since then have been critical of the process that led to the designation because the Fell Pony wasn’t included, in contrast to fell-dwelling sheep such as the Herdwick. Two people have told me, however, that the World Heritage designation is good news for the Fell Pony despite the breed not having been explicitly included. It has taken me several months of study to understand why they were so emphatic in their opinion. In short, the success of the Lake District bid for World Heritage Site status addresses one of the worst threats to keeping Fell ponies on the fell. We all know the Fell Pony on the fell is threatened. It’s threatened by the declining number of hill breeders. It’s threatened by other hill farmers not wanting ponies on the fell. It’s threatened by the costs not matching revenue. But there’s another threat that’s probably the worst threat of them all. That threat is the belief by some people that the proper state of the fell is to have no domesticated animals living there at all. This recent success of World Heritage Site designation for the Lake District was the result of a third application. The first application was made in 1986 and was as a mixed state of cultural and natural values. The second was in 1989 in the cultural category. The successful application submitted in 2016 was for cultural landscape which recognized the role of farming and industry in shaping the area, as well as the area’s impact on artists and writers and on the conservation movement. From the perspective of the Fell Pony, it is the recognition of the role of farming and domestic animals in shaping the landscape and culture we know today that gives hope. Had the focus of the designation been instead on a natural landscape, then the future of domestic animals on the fells would be bleak. While the World Heritage Site designation gives hope, work is required for the Fell Pony to benefit. Fell-dwelling sheep are well integrated into the Lake District National Park’s Farming initiatives. Sheep-related events are listed on the Park’s website. Given the Fell Pony breed’s part in the region’s cultural heritage both as a fell-dweller and the source of early horsepower for industry, the breed certainly can and should become a part of the World Heritage Site story. I believe it can be if we as a community want it to be. Information like this about the Fell pony breed can be found in my book Fell Ponies: Observations on the Breed, the Breed Standard, and Breeding, available internationally by clicking here or on the book cover.